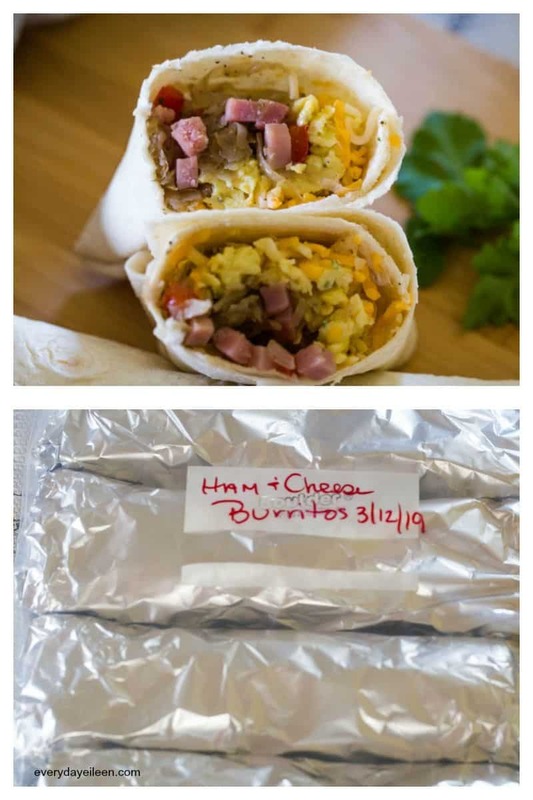 Make Ahead Breakfast Burritos Recipe are a fabulous freezer friendly meal! They’re a great recipe to add into your weekly or monthly meal planning! Use this recipe as your base breakfast wrap and feel free to adjust flavors to your family favorites. We often sub bacon and sausage and other veggies in the fridge that we need to cook! 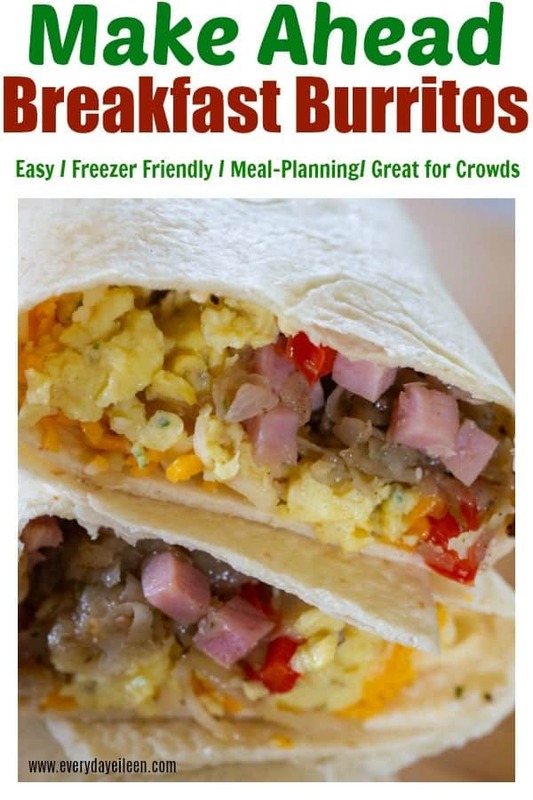 A great way to have a variety of breakfast burritos in the freezer! When there are veggies and proteins in the fridge that need to be used up, these burritos are a great way to utilize those veggies and make some delicious make ahead, freezer ready breakfasts! I have always been a meal planner/make ahead freezer meal person! As a busy Mom whether my kids were young or when I was working full-time, last thing I needed to do was worry about everyone eating healthy meals. Make ahead meals makes it easier, especially for hectic mornings! My make ahead egg muffins are a hit. 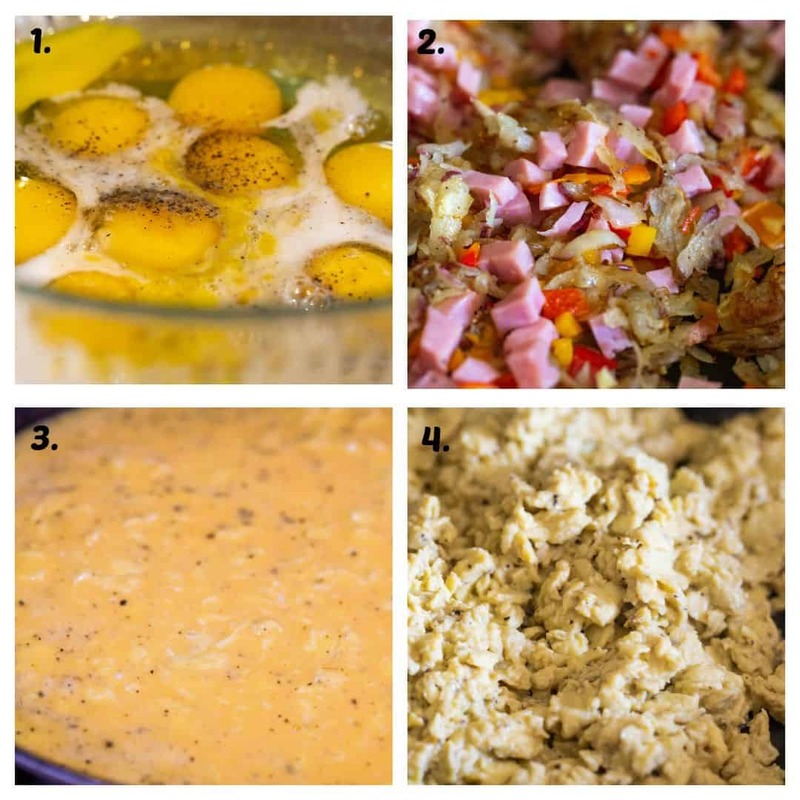 Today I want to share another easy recipe for Make-ahead Breakfast Burritos! These are great for everyone to enjoy for breakfast! I love heating these up for lunch too! I am on this make ahead frenzy lately because the family is out of control busy! Spring lacrosse for my daughter has been crazy and everyone else is running on crazy schedules! If we are crazy, I figure you must be as well! So I thought sharing one of my families favorite freezer friendly burritos was in order! My family loves a local place in our town that makes killer burritos and they are not cheap! I started making these because the kids loved the burritos from the taco place and my money was burning out of my pockets! These burritos are so cost effective. We make them every week. I cannot keep them in the freezer and I am not complaining, kids are enjoying them! Hubs and I are enjoying the savings! Whether you have a family, live alone, or a couple, breakfast is so important! A good breakfast void of too much sugar, even better! Another reason I love making these burritos! 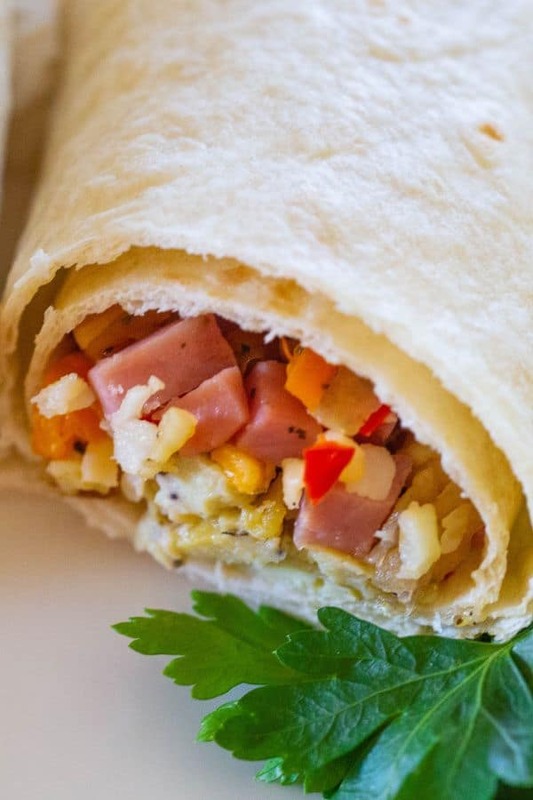 These burritos are made using ham, peppers, eggs, potatoes, shallots, and cheese! Once you make these, feel free to substitute your favorites to make your favorite breakfast burritos! shredded cheese – colby jack/cheddar mix is a favorite. The recipe calls for grated potatoes, are they already cooked? No! It takes just a few minutes to grate raw potatoes. I don’t even peel them. After grating potatoes, squeeze out excess water. Use a cotton cloth or thick paper towel to squeeze out the water from potato. Can breakfast burritos be frozen? Absolutely! 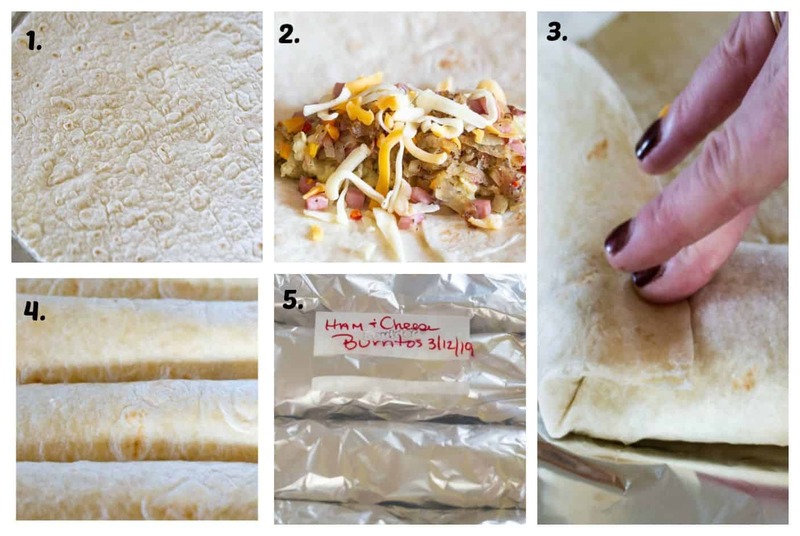 Make your burritos and wrap in foil. Place in freezer friendly storage bags, labeled with the date and what is in the bag! Refer to the experts at the USDA for any questions regarding freezing food! How do you reheat the breakfast sandwich in the oven? When reheating in the oven, take them from freezer to fridge the night before. Reheat at 350 for about 10-15 minutes. Placing from freezer to love will take longer, about 20-25 minutes. How to reheat breakfast burritos in the microwave? Remove the tortillas from the foil. Wrap in parchment paper or a damp towel to keep the tortilla soft, microwave for about 2 minutes. This recipe uses low-carb tortillas, can regular tortillas be used? Yes, use the tortillas that your family enjoys! Can a mixture of eggs and egg whites be used to make the egg burritos? Yes, I switch these up all the time! For the kids, I use whole eggs because I want them getting all protein. For health reasons, I use half eggs and half egg whites for mine. Can the ingredients be varied for the burritos? Absolutely! For variety, swap bacon or sausage and your favorite veggies and cheese. Label your burritos so you know what is in each breakfast sandwich! Cooks 11-inch Non-Stick Saute Pan This is a great non-stick pan, affordable and holds up to every day cooking! Veggie Egg Scramble: An easy egg recipe filled with veggies! Make Ahead Egg Muffins: Easy to make and these egg muffins are delicious! Spinach Mushroom Frittata: Another tasty egg dish that takes little effort to make and has amazing flavor! Peanut Butter Baked Oatmeal from Lauren Kelly Nutrition, this oatmeal is so flavorful! Be sure to squeeze out excess water from the shredded potatoes. Ensures potatoes won’t be soggy when cooked. Let the potato filling cool to room temperature before building burritos. Tortillas won’t get soggy. Burritos can be kept in fridge for about 3-4 days. The breakfast burritos can be kept in the freezer for about 3 months. In a large bowl whisk the eggs, milk, parley, salt, and pepper. Set aside. Heat a skillet over medium heat, spray with non-stick cooking spray, saute shallots, peppers, diced ham, and shredded potatoes. Season with salt and pepper, to taste. Saute until veggies are soft and cooked through. Remove filling and set aside. add in the eggs and scramble till cooked through. Remove from heat. Divide the eggs, potatoes, scrambled egg and shredded cheese on each tortilla. Place the filling in center of burrito. Fold bottom of tortilla up over center. Bring both side in towards center. Delicious make ahead breakfast burritos are a great freezer friendly meal. These are easy to prepare and you can change up the ingredients to your favorites. A great way to use up veggies in the fridge! Great for a crowd! Going camping, bring these along to reheat quickly! Into a heated large skillet, over medium heat add olive oil. Add in the grated potatoes, red pepper, and shallot. Season with salt and pepper. Saute for about 5 minutes, stir in the diced ham. Saute another 3-5 minutes. Potatoes should be cooked and veggies soft. Remove the filling and place in a bowl until ready to make burritos. Wipe pan clean. While burrito filling is cooking, in a medium bowl whisk the eggs, milk, parsley, basil, garlic powder, salt, and pepper. Return pan to the stove, over medium heat, add 1/2 teaspoon of butter or use butter spray. Add in the egg mixture and scramble the eggs . Lay out the flour tortillas. evenly divide the potato filling, eggs, and cheese on the tortillas. Fold tortillas into burritos. If freezing, wrap with foil and place in freezer safe gallon bags, labeled with date and description of the sandwich. For keeping in the fridge, wrap in plastic wrap. Reheating in the oven, wrapped in foil for about 5-6 minutes. Frozen burritos in the microwave, remove foil, wrap in a paper towel and reheat for about 1-2 minutes. Note 1: No need to peel potatoes before grating. Drain excess water from the potatoes by either squeezing them in your hands. The potatoes can also be squeezed in a cotton towel over the sink. Ensures the potatoes won't sweat too much liquid into the filling. Note 2: Nutritional values are using low-carb tortillas. I need to make a big ole batch of these for my kiddos.. and me! Such a great time saver in the mornings. I hope the kiddos enjoy! Mine love these burritos! Make ahead breakfasts are the best! These look delicious! I so agree! Make ahead breakfasts make life easier in the morning! Any make ahread breakfast is what I need in my life. The mornings are always so busy for me, so anything will help! I hope you make these and they make the morning a little easier for you! Thank you for all your tips on how to reheat them! I love breakfast tacos and burritos but never considered them for make ahead meals because of the tortillas. The tips with the parchment paper is so good. Iam so glad you enjoy the recipe for the burritos! Enjoy! Make ahead is easier than you think! These burritos would be a huge hit in my house! Love make ahead breakfasts, and these are so filling and versatile! Definitely adding them to my breakfast meal prep rotation! Excellent Leanne! I hope you enjoy these breakfast burritos over and over! Perfect for weekly meal prep! I love making both breakfast and lunch meal prep dishes! Definitely looking forward to adding this to my meal plan! I am happy you love the recipe lori! Enjoy! The hubs and I are obsessed with all things burritos. We make a variation of easy Mexican recipes throughout the week. I love that these can be made on Sunday and saved for breakfast throughout the week. This frees up so much time without compromising our love for fresh food and flavors. I agree with you! Love burritos and making them ahead is so easy! Enjoy! A great idea Michelle! I have got veggie egg muffins that are freezer friendly too! I love make-ahead breakfast burritos! It really helps my morning to prepare breakfast and this one is also perfect for breakfast on-the-go. Adding this to my breakfast rotation. So glad you enjoy the recipe Linda! Ihope you enjoy! Making these delicious and flavorful Burritos are a treat to my family. Love the idea of freezing them too. Love the combination of ingredients too. Super delicious. Thank you so much Veena! We love them and I hope your family enjoys! I really need to be more proactive with meal planning. 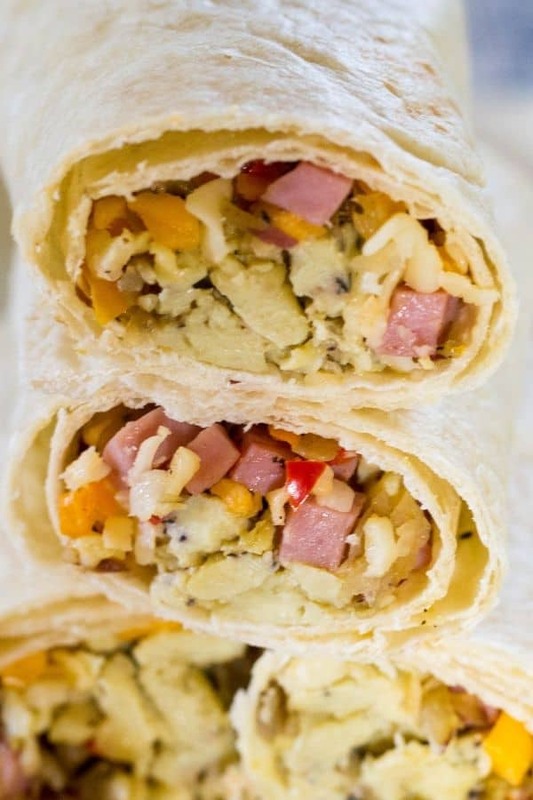 I would absolutely love these breakfast burritos and to just have them on hand would make the morning routine go so much easier. These look delicious! Thank you for sharing all of your tips! Once you meal prep the first time, it gets so much easier! I hope you enjoy these breakfast burritos! I love having egg wraps in the morn but most times I’m too pressed for time. Making them ahead is a great idea! These look delish! Thank you Tammy! I love these because I am not a morning person and everyone gets to heat them up and enjoy at their own pace! Breakfast burritos are my favorite way to start the morning, so I’ll definitely have to make a batch! I love how easy this will make breakfast when I’m on the go. Thanks for sharing! 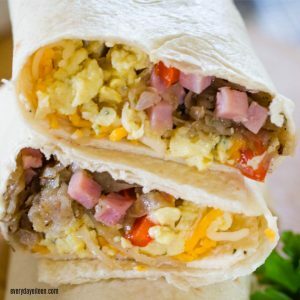 Enjoy these breakfast burritos Amanda!I hope you get lots of use out of this recipe! Oh I would love to have a freezer full of these! Perfect for grab and go breakfasts! All your tips make them so easy! I am happy the tips and the breakfast burritos are good for you Pam! Enjoy! Thank you Danielle! I am happy you and your boyfriend will be enjoying these burritos! These look sooo much better than the frozen burritos in the grocery store! I also like the use of shallot which is a nice touch. I definitely want to try these! I am glad you like the burritos Kate! I love adding shallots too! Enjoy!